Ah, what can scrappy, improv strip sets not accomplish? 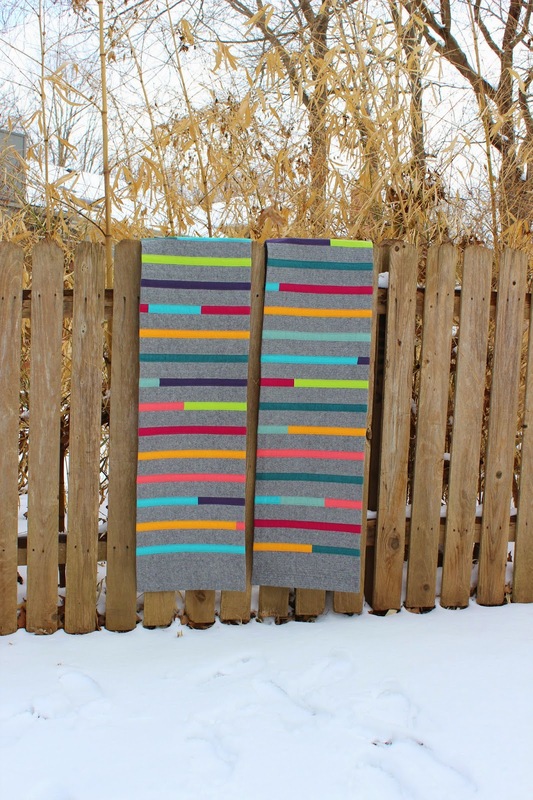 Many things, I'm sure, but at the moment they are just what I want for making this rainbow table runner. I was able to use some of my smallest scraps to create monochromatic strip sets. I added neutral strips sets to each end, trimming and sewing at a 45 degree angle. I staggered the strip sets to make a serpentine like arrangement. Within each strip set, I tried to work from darkest to lightest value. I really like how this complicates the design slightly, by softening the points at the lightest end of each strip set. I flipped the strips sets around at random, so the values flow erratically across the runner. I think this kind of subtlety adds so much interest to a design. 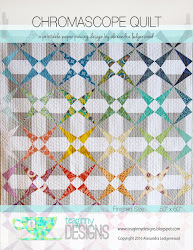 If the strip sets were made of fabrics, all equal in value, the pointy design would be too stark in my opinion. I had so much fun making this. 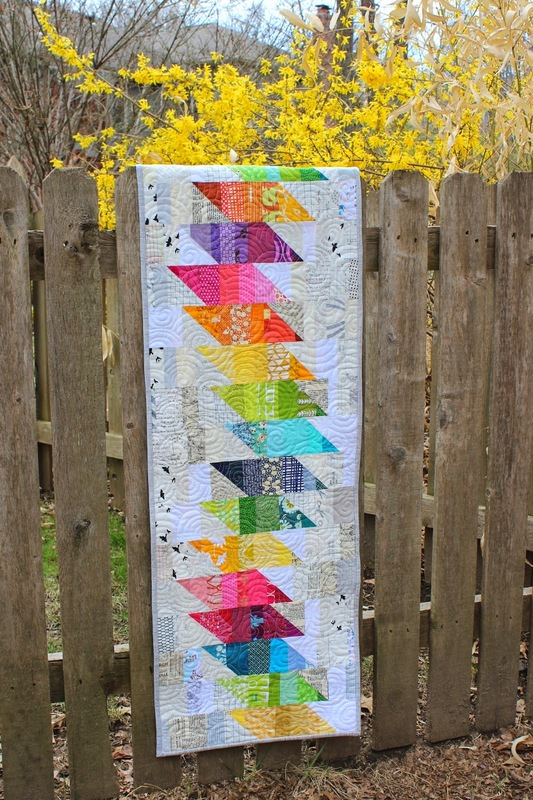 I seem to make a lot of rainbow things from my scraps, but that is really part of the joy for me: getting to play with every color and all my favorite bits of fabrics from projects past. While I love to sew rainbows, I don't actually decorate with them often. 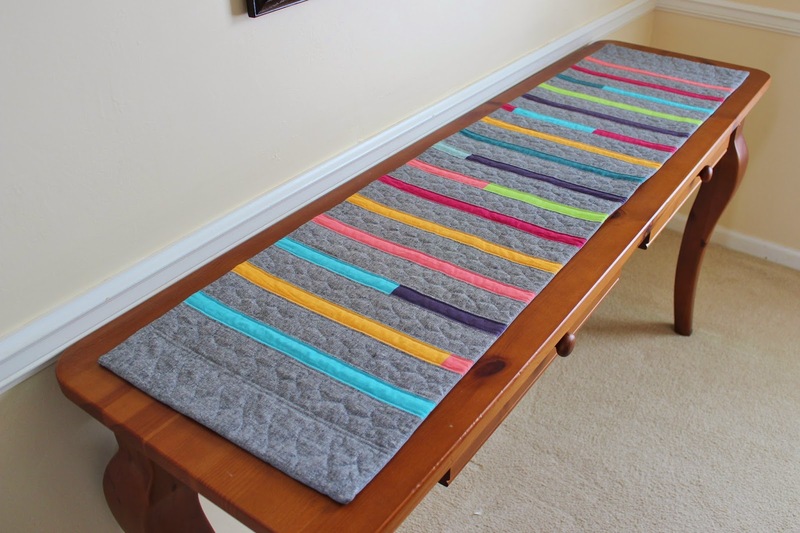 So this 16" x 47" table runner is available in my etsy shop. 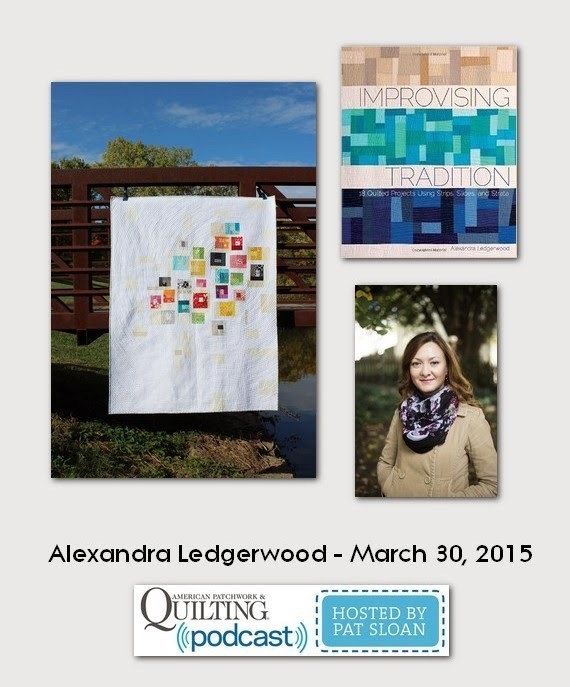 I'm very excited to share that I will be chatting about improv piecing, quilting, and sewing in community with Pat Sloan on American Patchwork and Quilting Radio this coming Monday, March 30th at 4pm Eastern/3pm Central time. You can listen online live or download the podcast anytime. 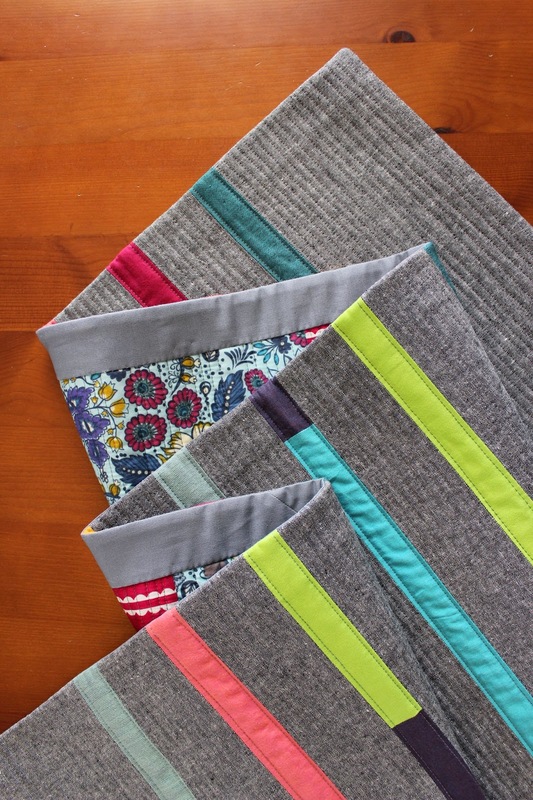 I have found that I really enjoy listening to podcasts while I sew. Do you have any favorites? 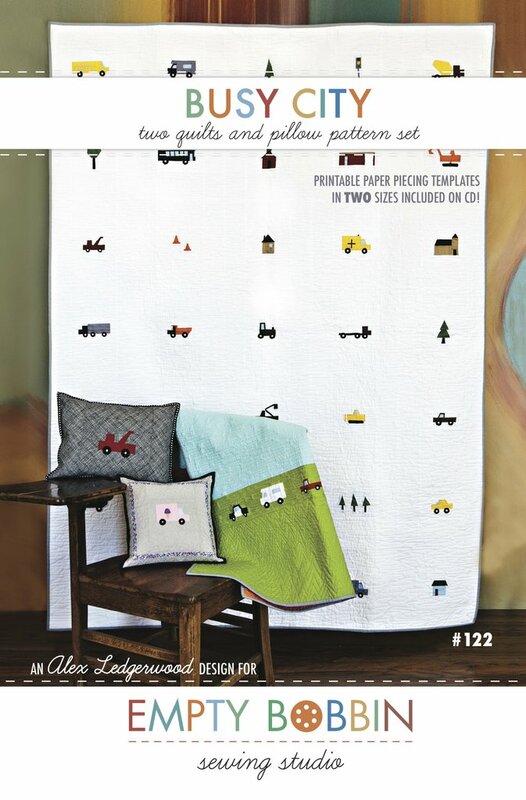 I've had this project pieced and ready to quilt since I made the first digger version this past summer. 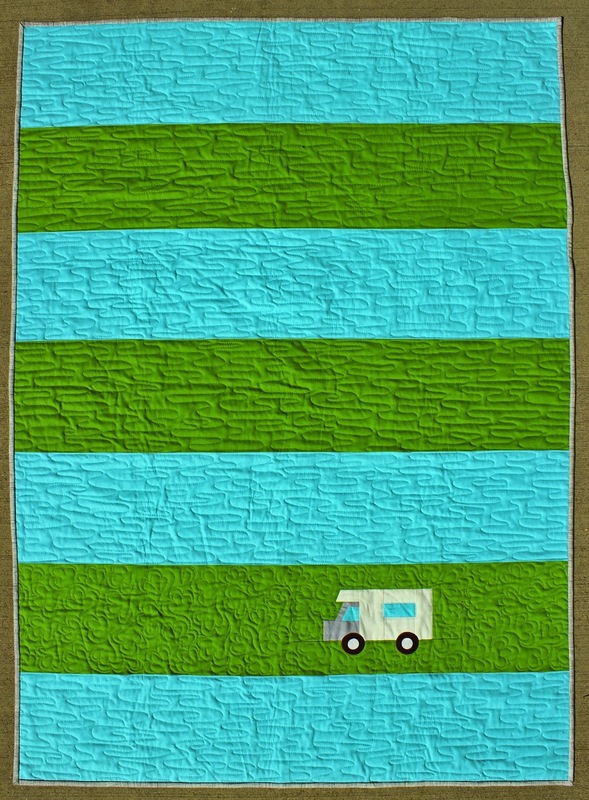 I decided to used the succulent design from Christina Cameli's Craftsy class to make the stripe with the RV block stand out and a simple elongated stipple over the rest of the quilt. 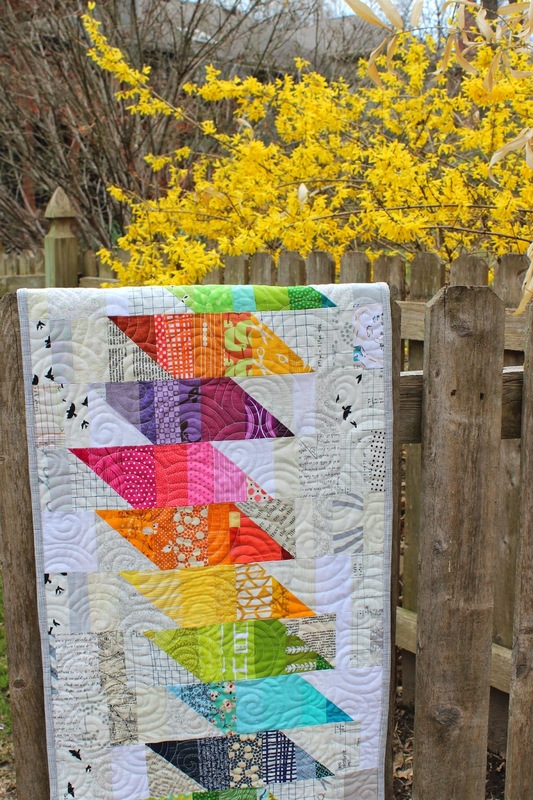 I finally finished up the quilt this weekend, enjoying the nice weather as I hand stitched the binding. The RV block from Busy City is such a fun one to feature. 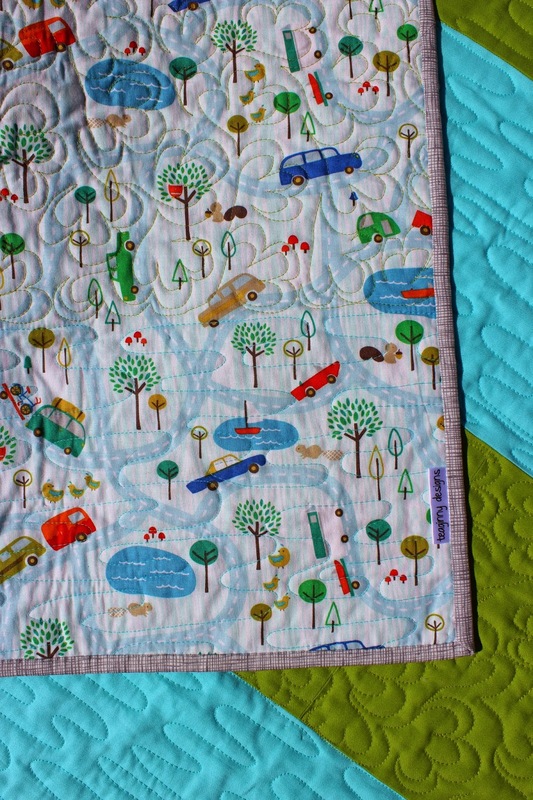 I even lucked out and found a giant polka dot fabric in my stash to use for the wheels, which are appliqued with fusible web and a blanket stitch. 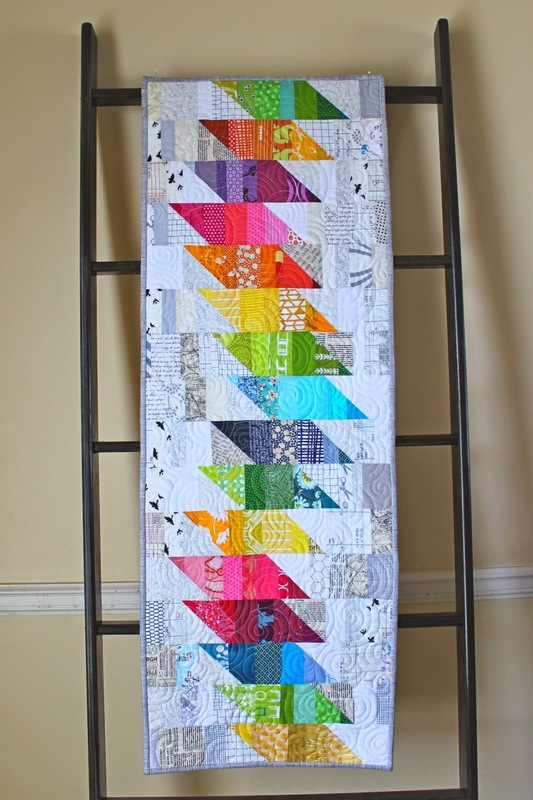 I enlarged the block by 200% and set it into the 40" x 56" striped quilt. 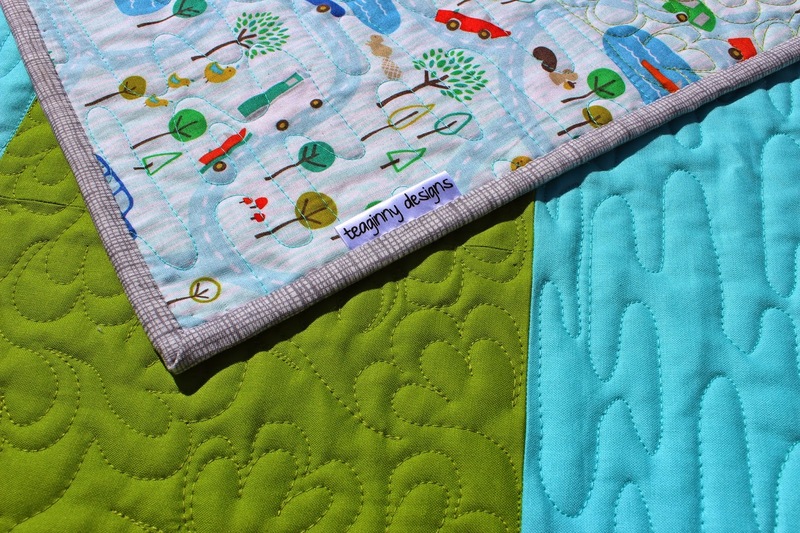 I backed the quilt with a cute camping fabric. 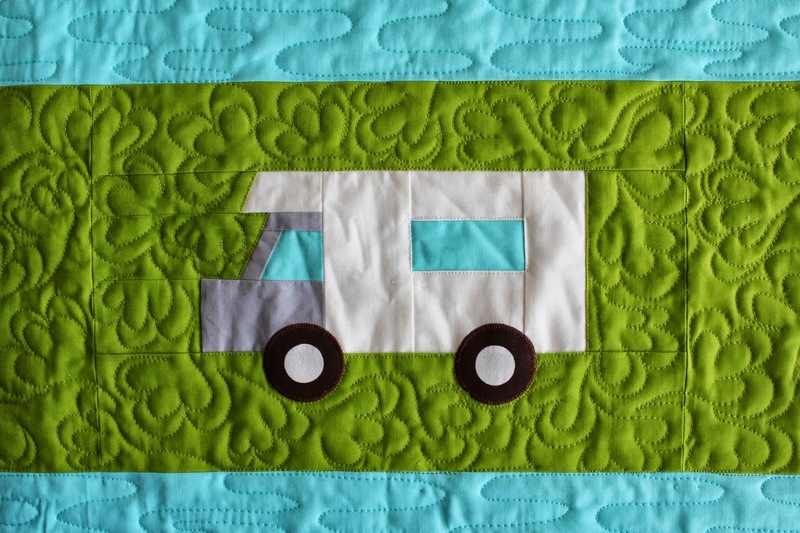 I'm really hoping some family who loves to travel in their RV finds this. It is listed in my etsy shop. 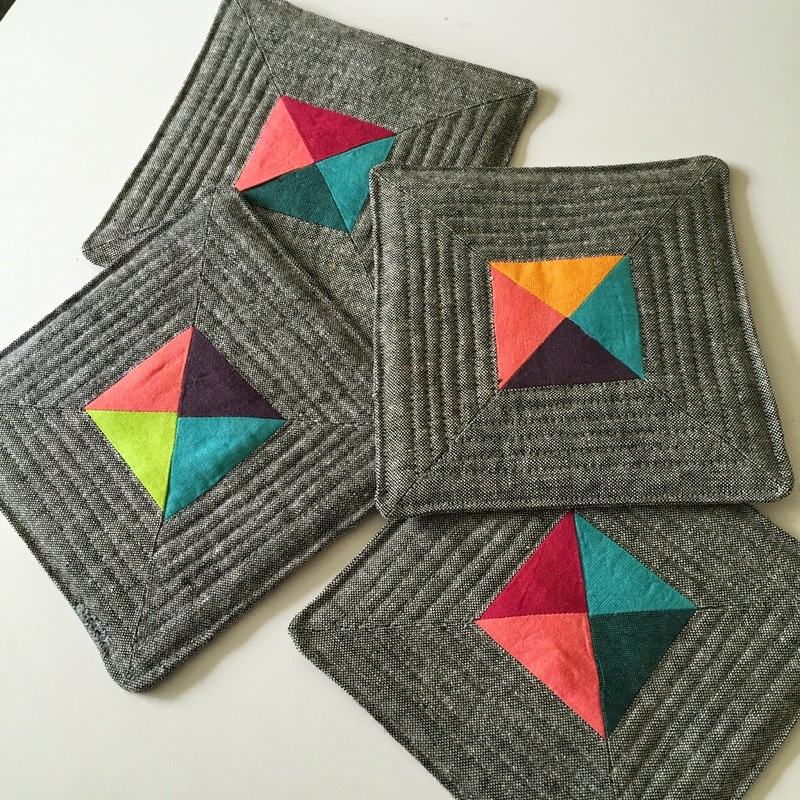 These improv, striped table runners were inspired by Laura's hand knit sweater (which she tells me was inspired by the pattern sample for Tanis Fiber Arts' Lifesavers sweater pattern). I love the random color changes against the constant background of black Essex linen. 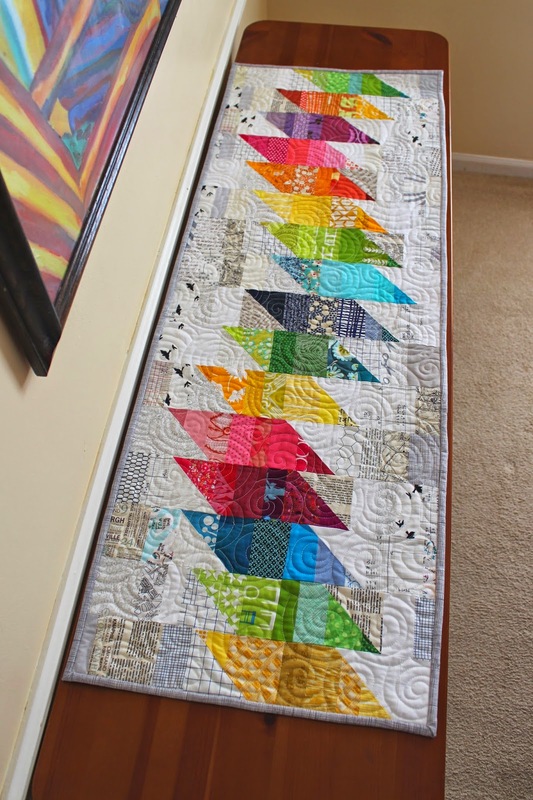 I chose a variety of shot cottons from my stash, cut them into strips of random lengths and pieced them end to end. Next, I sew the length of shot cottons into width of fabric strips of the black linen. Then I chopped the strip sets into 14 1/2" widths. It was all very casual and fun. 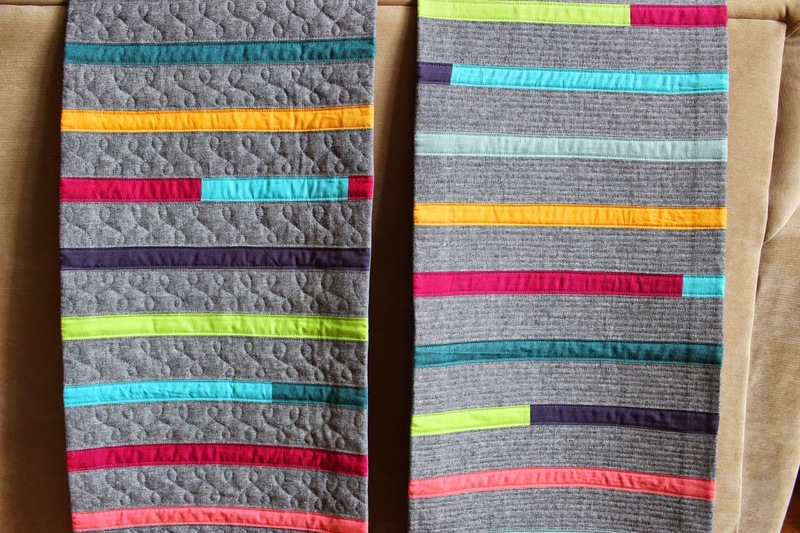 It turns out, I had enough strips to make two runners. 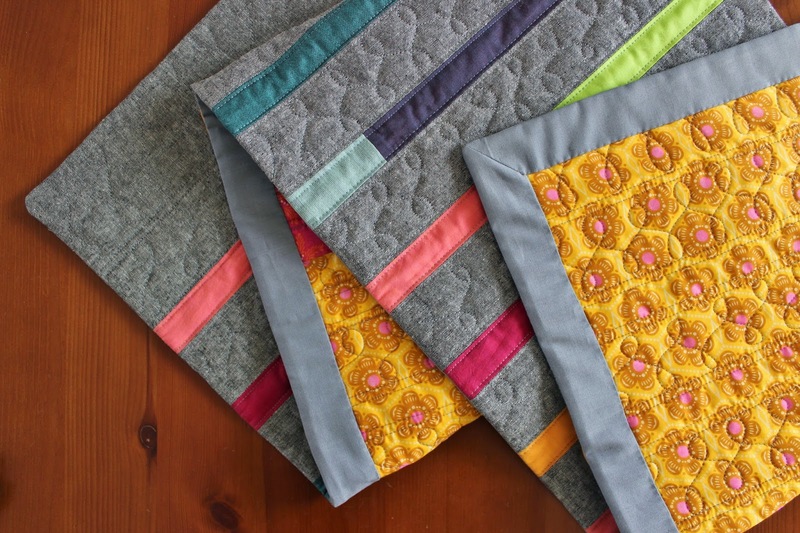 It's always fun to see what quilting does to differentiate two nearly identical items, as I've noted before. 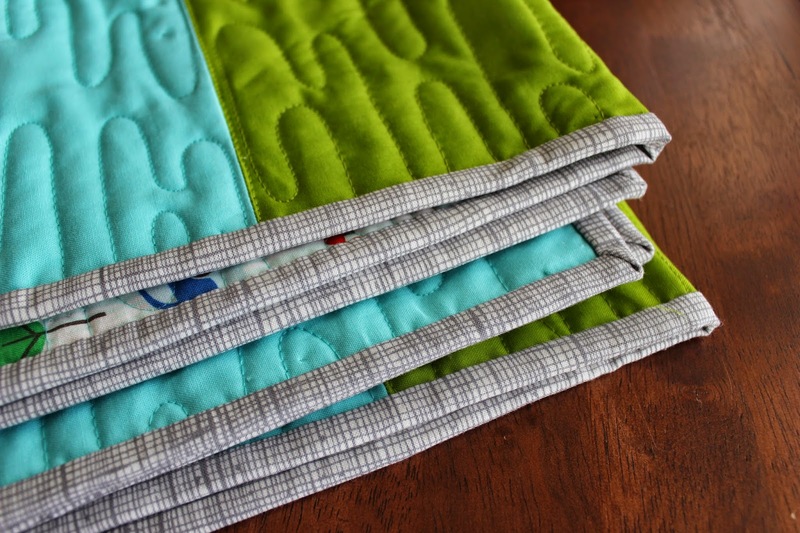 So, I quilted one with straight lines and one with free motion figure eights. I think the texture of each is so different but equally lovely. 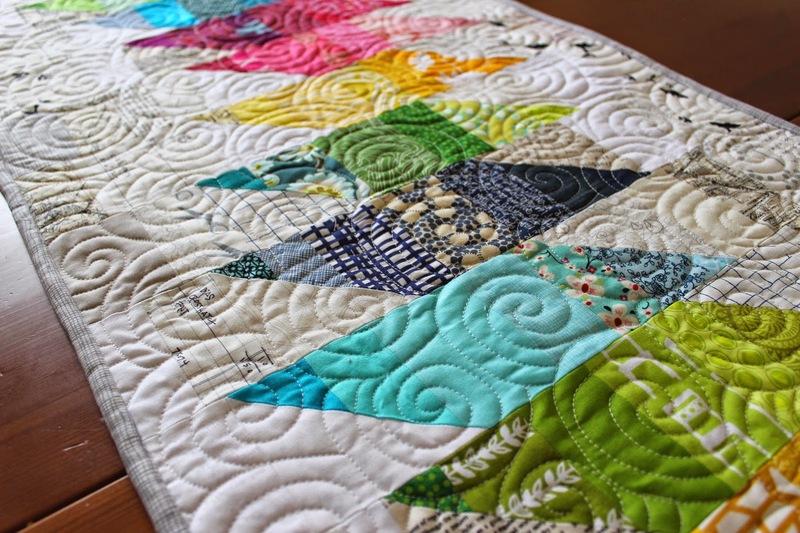 I chose to finish the edges with a facing, rather than binding, because I like the look of the stripes running right to the edge, with no border. I referred to several facing tutorials. 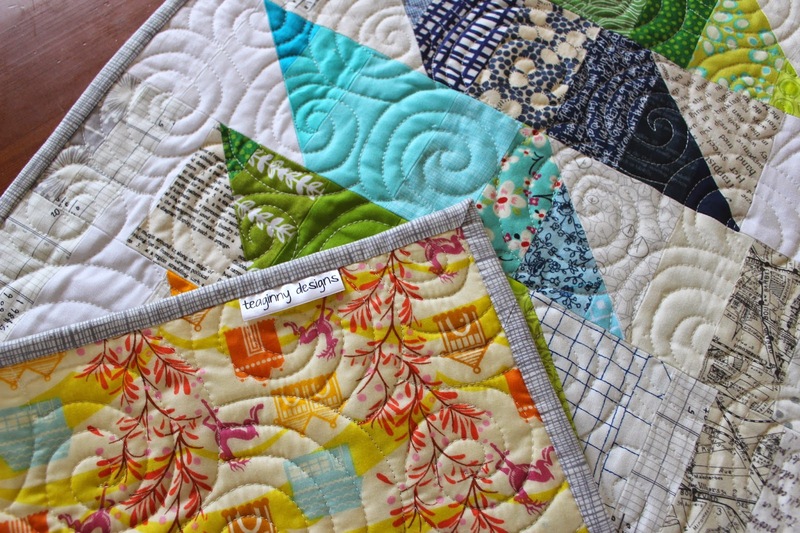 I wanted to use a mitered corners, and I mostly followed this tutorial by Susan Brubaker, although there is a great one by Victoria Gertenbach that is even easier and does not require mitering. It's a little more trouble than a regular double fold binging, but I'm glad I learned something new. 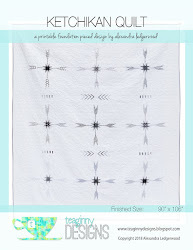 I especially love the backing fabric I chose: four different voile prints from Anna Maria Horner's Folks line. It was so nice to stitch. 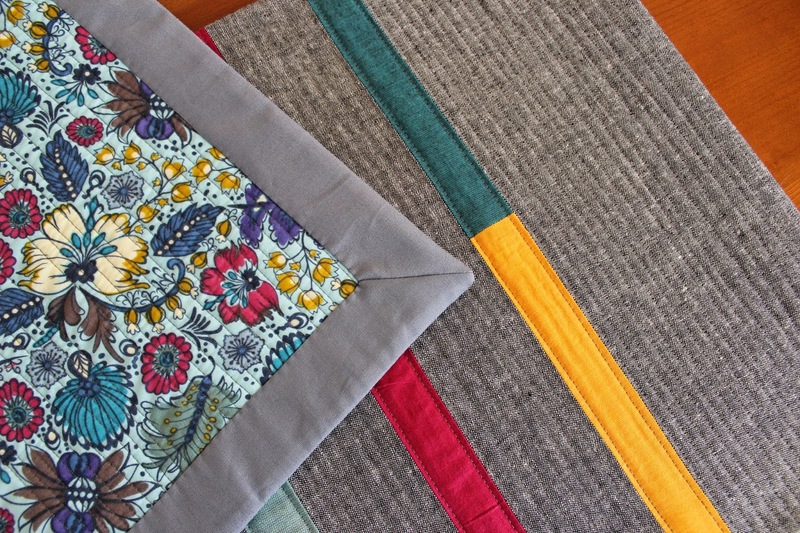 These two 14" x 56" table runners are listed in my etsy shop. Sold out.